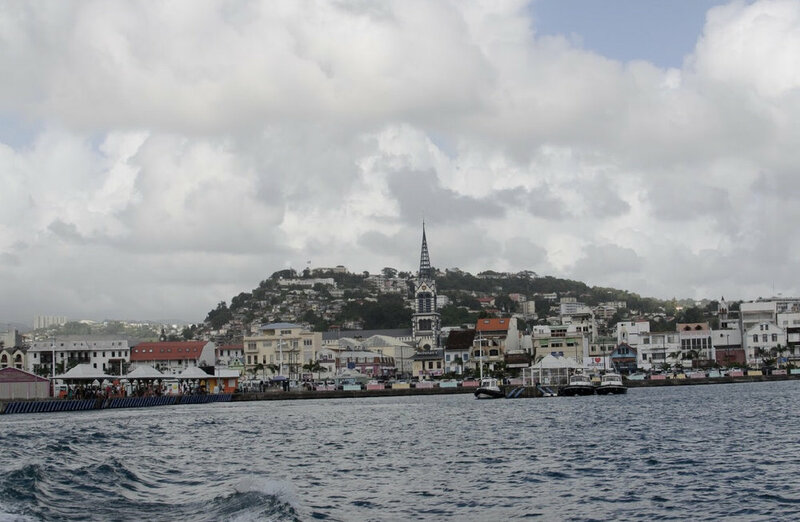 The cityscape of Fort-de-France is rich with color, even in times of overcast. 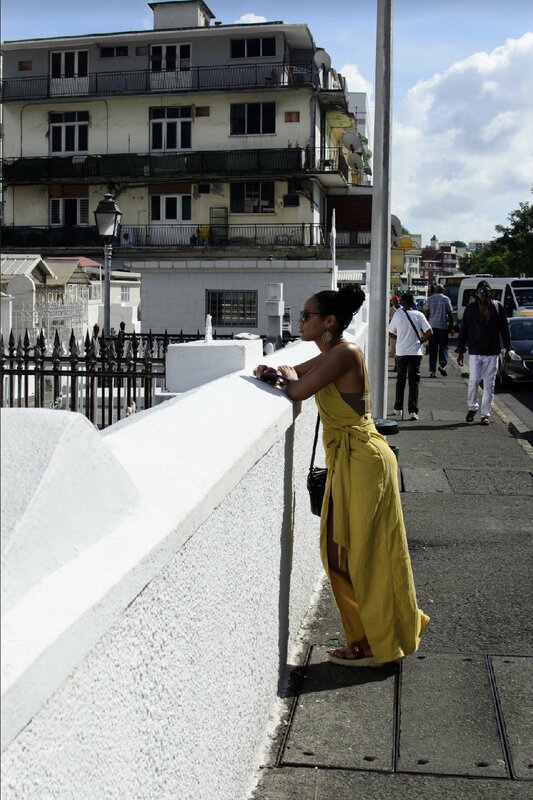 Frolicking through the Fort-de-France's city center in a dress by Sabo Skirt. Markets, museums, and the infamous Schoeler library line the city center. I made the mistake of booking a hotel in a city not located on the island. Fortunately, our taxi driver was able to help us book at the Karibea Squash, an affordably quaint gem with a beautiful infinity pool. We met a kind older black man named Serge on the pier who sold us the best reggae boat tour you could buy on the island, equipped with lots of liquor and turtle swimming. Waiting on our turn to go inside the bat cave. Inside the bat cave the rock was lined with tons of crabs. Maison Clementin, the villa we stayed in the remaining nights. I highly recommend the Tobago room at the Maison Clementin. Not only is it beautiful, but it comes with a pool for two in addition to the larger pool on the grounds. On our way to the complimentary breakfast the villa provided. A lady in the mall recommended we visit Lili's Beach during our stay, and it did not disappoint. The staffers were friendly, the food was great, and it wasn't as crowded as other beaches. We navigated Fort-de-France mainly by bus, which was the cheaper alternative to taxis and helped us see more of the island. The 110 will take you anywhere you need to go, including the casino. The Schoelcher Library is one of the premier historic sites on the island. The monument was built in 1889 in France, and shipped piece by piece to Martinique. I am always amazed by cemeteries in South America. Although this wasn't as colorful as ones that I've witnessed, the monuments are just as elaborate. Taking in the sites in my favorite maxi dress from Sabo Skirt. All the neighborhoods are built on really steep inclines so if you're walking, watch out. You never know who is turning the corner (and at what speed). Anse Noir, a black sand beach, was my best experience by far. 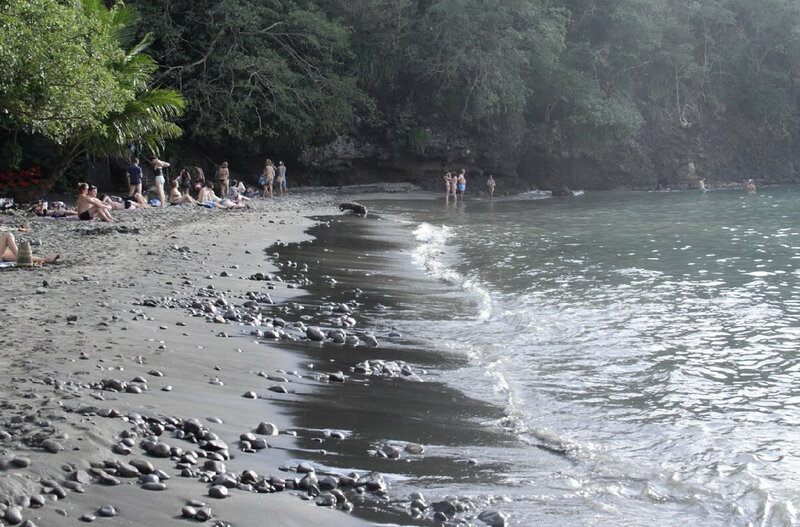 The black sand glistens in the sunlight and is amazing for your skin. In between work, writing and the woes of commuter life in New York, sometimes we’re granted favor in the form of a flight deal. Escapism came as a trip to Fort-de-France, the capital of Martinique known for its French architecture and breathtaking beaches. For a passport stamp cheaper than a domestic flight, I was eager to explore new territory despite not speaking the native language. This presented a barrier when we lost a day because of a misread flight time (completely my boyfriend’s fault) and when we arrived the following day to find out the hotel we booked was on an entirely different island (completely my fault)—providing a great excuse for cramming in adventure-filled days from sunsrise to sunset. Vibrant, rich colors offsetting an overcast sky was the beauty of Martinique in its entirety: perfectly imperfect. The weather was amazing, not too hot but warm enough to spend the day island hopping or never choosing to leave the pool. 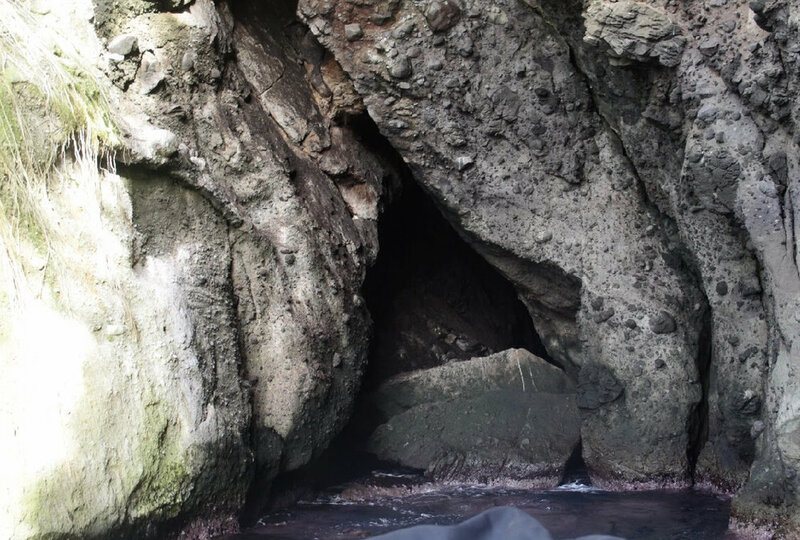 The volcanic ruins left behind a black sand beach that was perhaps the best organic beauty fix to ever grace my skin. 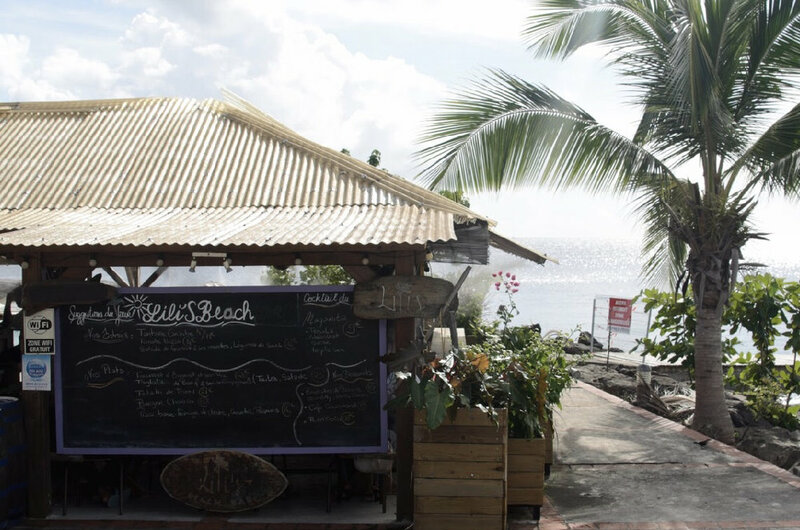 We frequented Lili’s Beach Bar for a breathtaking view and rum-based concoctions, and took a reggae boat tour that included bat caves and swimming with giant turtles. Outfitted in Sabo Skirt, I felt completely prepared to take on any and every day—whether headed to the beach or sightseeing. 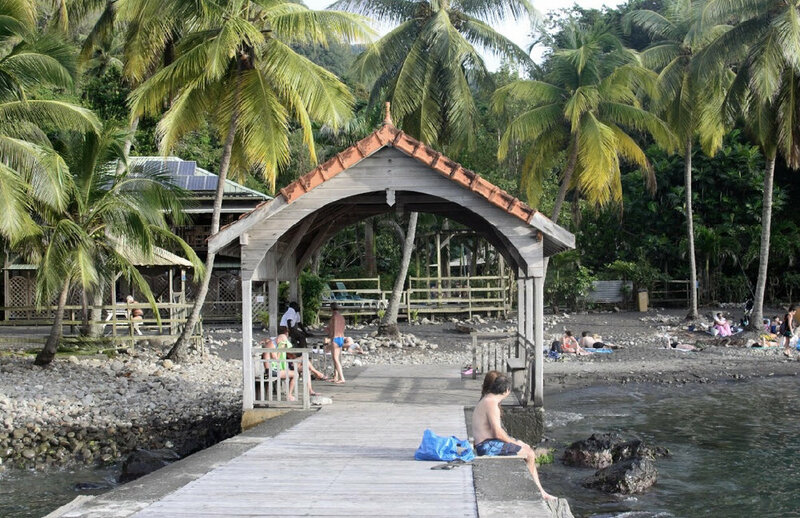 Taking a ferry to Point du Bout in a polka dot dress or in a bright wrap dress that doubled as both a cover up and a fierce dancing ensemble showed not only felt confident and comfortable, but perfectly coincided with the island’s picturesque scenery. See more from the trip above.